Represent the state of Louisiana in its partnership to plan, design, construct and launch a new cultural arts facility. 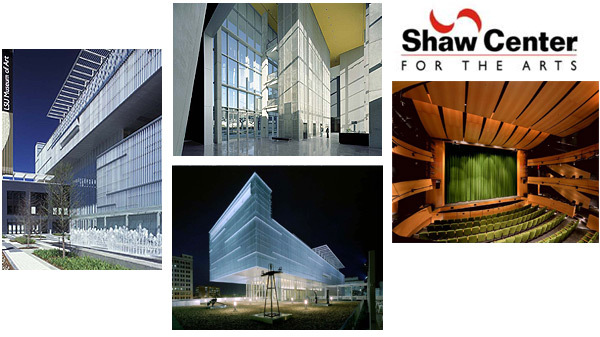 The Shaw Center for the Arts is a $55 million 125,000 square foot multi-use arts facility created through a partnership between the State of Louisiana, Baton Rouge Area Foundation, Louisiana State University and the City of Baton Rouge. Coordinate steering committee during initial planning phase to ensure continuity between decision makers and project status. Supervise state’s legal and financial commitments relative to all partners. Research national cultural arts centers and provide strategic input on programming elements, budget and staffing model(s). Recommend marketing strategies, organizational branding structure and write press releases for development updates. Manage executive director search committee including drafting of job announcement and description as well as generating interview process and materials. Ensure smooth transition between new administration officials for outstanding obligations and commitments relative to project completion.